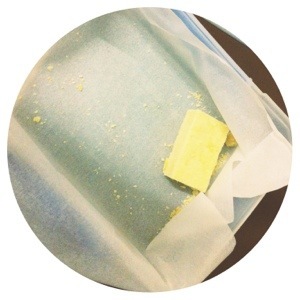 pretty much the best shortbread recipe ever | Somewhere else this is normal! I swear there was some there just a minute ago? It was the best damn shortbread I have ever tasted. And I don’t normally like shortbread. I found this recipe in my recipe journal, I must have cut it out a million years ago with the intention of making it one day. So glad I found it. I promise you it was yum. It lasted all of a day, and that’s saying something. I dare you to make it. Do it, now! Pre heat oven to 150 degrees. Beat butter and sugar till creamy. Gradually add flours, beating on low speed until almost combined (I dumped it all in at the same time-still tasted good). In the bowl, use hands to bind the ingredients. On a lightly floured surface, knead the dough (it will be slightly crumbly, thats a good thing). Pack into a small biscuit tray (I used a spatula to smoosh that little bit more). Score into the desired size pieces (I cut instead of score which made getting them out much easier). Bake for 45mins -1hr. It was sooooooooooo good. I had shortbread with cold milk last night and felt myself wanting to do a crossword puzzle and found myself dreaming about slippers. Such a lovely feeling. Now I must go and run 5 km to burn it off. There should be warnings on baked goods. I am bookmarking this page. My boyfriend loves shortbread! Thanks.